Go! Running Tours in Florence takes you back through the centuries as you explore the home of the Italian Renaissance. With artistic pedigree and cuisine to die for, Florence is perfect for culture vultures, foodies and Insta-addicts alike. The city centre is a UNESCO World Heritage Site, and easily small enough to be explored on two feet. Our private runs around the age-old winding streets give you an awesome workout as your guide reveals the secrets that the city’s old walls guard. You can even check out the beauty of Florence’s neighbouring city, Siena. So don’t give it a second thought. Running tours in Florence are the best way to see this city which is just begging you to discover it. All you need are your shoes to run and your phone to capture the endless spectacular architecture. Let’s get running! I cannot recommend the Florence running tour highly enough!!!! Lapo arrived right on time and was extremely friendly and professional. He knows so much about the city, especially the architecture. Our run was full of fascinating stories about well known landmarks as well as lesser known features. I was only in Florence for a day and a half on business but I felt like I got a wonderful overview of the whole city. After the tour he sent me a bunch of great pictures from our run along with recommendations for places to visit and eat. This tour really was the highlight of my trip! Florence, or Firenze in Italian, is a goldmine of culture from a bygone era. It flaunts its status as the birthplace of the Renaissance with its elegant architecture and world-class art museums. The churches, basilicas and Florence Cathedral that dominate the cityscape demand you to look up at their intricate frescos. Then, you can head outside onto the windy, cobbled streets for some seriously wistful daydreaming. Guided running tours in Florence show off the highlights of the UNESCO World Heritage city centre in no time at all. Choose between the must-see tour, the hills tour, An off-the-beaten-track trail run and much more. Lapo, your friendly and knowledgeable local guide, can even show you another of Tuscany’s major cities, Siena. Cuisine is a big deal in Florence. Tried-and-tested recipes passed down through the ages are always on the menu in the city’s fantastic restaurants. And what is an Italian dinner without a fine wine to go with it? As the capital of Tuscany, one of Italy’s top wine-producing regions, budding sommeliers will feel right at home. 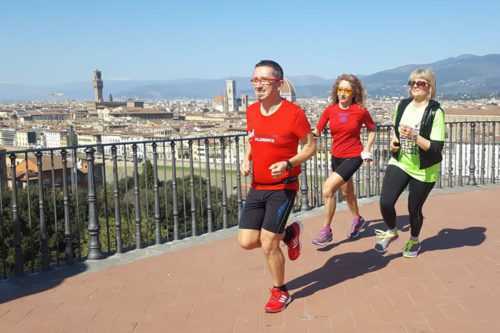 Tuscany is ultramarathon territory, so why not use our running tours in Florence as a gentle warm-up for a race? The EcoTrail Florence race in March covers 80 km, while Italy’s second-biggest marathon takes place in Firenze in November. So leave the guidebook at home. Experience Florence through Lapo’s gripping stories about the well-known sights and local secrets.